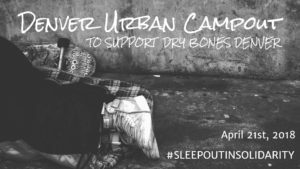 Dry Bones Denver is excited to present the Denver Urban Campout! Come together with your family, friends, small group, office coworkers, or youth group and experience a night on the streets in the heart of our city while raising funds and awareness in support of issues surrounding youth homelessness. There is a $25 sign up fee that covers all of our various costs – food, security, toilets, etc. We’d like to ask that you seek to raise a minimum $100 among your friends, family, and coworkers. Of course, if you raise more, excellent! Why campout? To raise awareness around the experience of the hundreds of homeless youth and young adults that seek survival on the streets of Metro Denver. The Urban Campout raises funds and awareness to support homeless youth and young adults in our community through the nonprofit organization of Dry Bones Denver. What is the Denver Urban Campout? Bring what you can carry on your back, just as many homeless youth in Denver have to do every day, and Sleep Out in Solidarity under the stars. You will enjoy dinner and breakfast together, and sleep outside on cardboard, in sleeping bags under tarps, much the same way that many of our friends do regularly. Plan to have your perspective on issues surrounding homelessness to be broadened as you enter an immersive experience that will challenge your view of personal ethics, social justice and equity. Expect for it to be an inspiring experience filled with fun and good memories! When and where is the Denver Urban Campout? We are partnering with a local Denver school to utilize their fenced schoolyard. The sleep-out will take place on Saturday, April 21 at the Whittier K-8 School fields. Will this be a secure event? Off-Duty Denver police officers will be onsite overnight at the event. Can I bring my youth group, Scout Troop, or children under the age of 18? Please do! We ask that you have one adult over the age of 21 for every 5 participants under the age of 18. Can I bring my pet to the campout? Unfortunately, we are unable to accommodate any animals at the event. Where will I use the restroom? There will be restroom facilities onsite. The only shower you should prepare for is the type that April provides for May flowers. Will we being camping with people currently experiencing homelessness? This is an opportunity to Sleep Out in Solidarity with young people experiencing homelessness, rather than an opportunity to physically camp with people currently experiencing homelessness. We don’t anticipate that anyone currently experiencing homelessness will register to attend this event, but do hope to share time and space with some friends who have transitioned out of homelessness. Why fundraise? Dry Bones Denver works hard, day in and day out, to create and maintain ongoing and genuine relationships that restore dignity and provide for the physical, emotional and spiritual needs of young people experiencing homelessness. Whether it be providing a home-cooked meal, connection to resources, new clothes for a new job, access to a shower and laundry, or life-coaching and therapeutic counseling, there is a need and an opportunity for financial partnership. Consider this your opportunity to come alongside and partner in life-giving work that is already taking place! Do I get anything for the effort I invest in fundraising? Not only will you get the satisfaction that comes with being a compassionate and charitable member of your community, there are three tiers of incentives to achieve for raising sponsorship support. Raise $100 in sponsorship support and receive a Dry Bones t-shirt. Raise $250 in sponsorship support and receive a Dry Bones hoodie. Put these rewards to good use in maintaining warmth at the Denver Urban Campout! In addition to the incentives mentioned above, you will earn a raffle ticket for each $50 of sponsorship support you raise. You will enter these tickets for prizes drawn on the evening of the event! Click on the Fundraisers tab under the Explore section of the list to the left of your Facebook feed. Let’s start with the basics – How much do you want to raise? THINK BIG! Don’t be afraid to set the bar high, after all the more you raise the greater your chance of winning big. When should your fundraiser end? Apr 21, 2018 Click the Next button. Pick a cover photo. Save this image to your desktop. Click the Edit button in the lower right hand corner of the stock photo. Click the Upload New Photo button. Choose the saved file as your Facebook Fundraiser cover photo. Share your Facebook Fundraiser with your friends and watch your sponsorship support roll in! I can’t figure this social media stuff out. Can I just bring you cash or checks on the day of the event? By all means, we appreciate it any way you get it to us! Have your sponsor make checks payable to Dry Bones Denver.